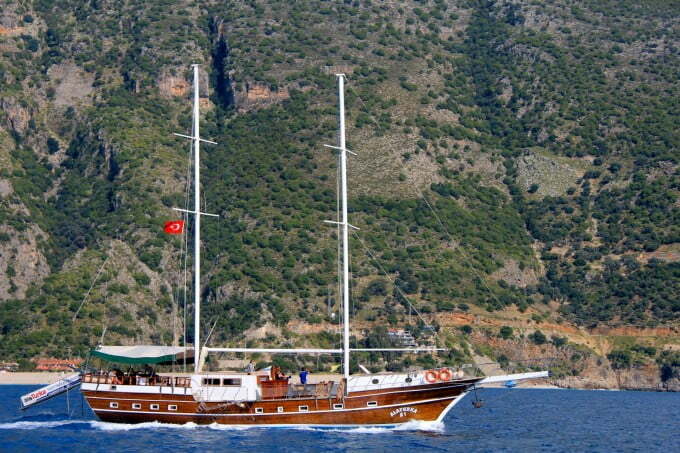 One of my best memories of travelling throughout Turkey is sailing the southern coast. As part of the Turkish Riviera, official Blue Voyage Cruise routes within it are widely sold every year. Even though the word Riviera conjures up images of luxury and private yachts, the Turkish equivalent caters for all price brackets, hence its popularity. I sailed from Fethiye to Olympos over 4 days, but it can also be done in the opposite direction. 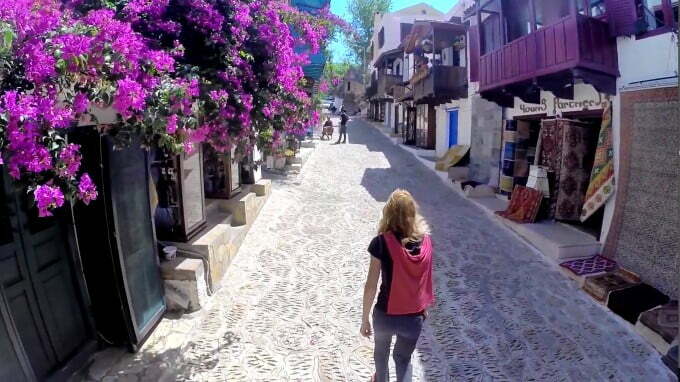 Most RTW backpackers do one of the two after a whirlwind tour of Turkey including Cappadocia, Ephesus, and Istanbul. 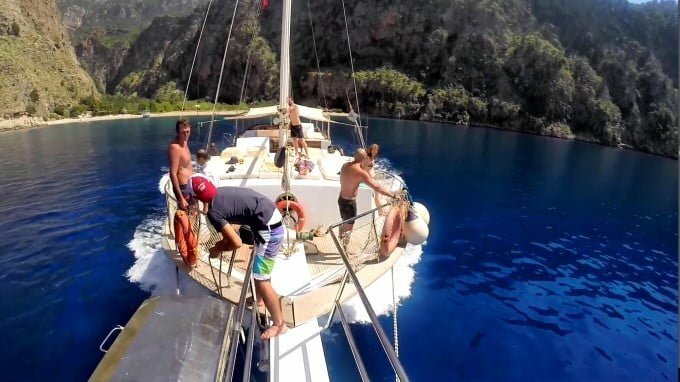 Sail Turkey which is part of the established Alaturka sailing group and owned by my friend and co-author of this article Ned, sell the route in both directions, and he says, the low prices are a big lure. Instead of booking an expensive, bank-breaking private yacht, people instead buy cabin charters from as little as 220 Euros, depending on the time of year. The basic cabins are often shared, but when I did my cruise, I never slept in it anyway because we spent nights on deck instead. My vivid memories of dropping anchor in Gemiler bay, and falling asleep on the deck while listening to gentle waves lapping the boat are a favourite of all my travels in the country. Another morning, just after waking, I sat on the gangplank sipping a coffee and a bobbing shadow in the water turned out to be a Caretta turtle, an endangered species that I am lucky to have seen. His friends soon joined him in circling the boat because apparently, they like the bread and chicken thrown overboard by passengers. The attentive crew took care of everything leaving me to sunbathe, swim, relax, eat, and drink copious amounts of beer! Another favourite part of my cruise though was docking into the various places of interest, also seen on the reverse Olympos to Fethiye route. 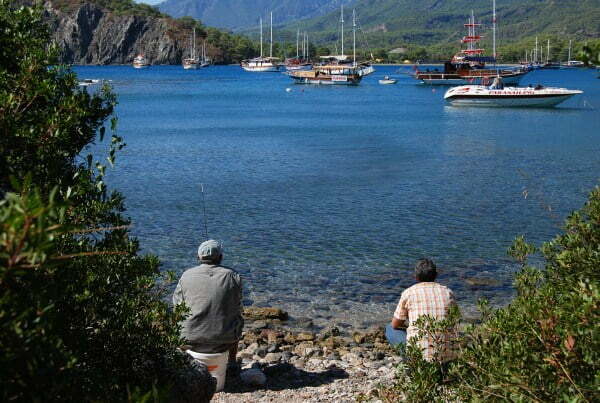 Most people before boarding boats at Olympos spend a few nights in the village of the same name. The attraction is cheap and quirky tree house accommodation. It is not a gimmick but a time honoured tradition because Olympos was one of the few places in Turkey to embrace travel early in the 1960s to accommodate western people completing the famous hippie trail from Europe. Just a short distance away, the surreal, fairy-tale appearance of the ancient ruins in a dense, and overgrown forest throw up a few gems such as old Christian churches. The nearby resort of Cirali also shares a beach with Olympos and is a suitable alternative for accommodation. Other than that, at night-time, it is worth seeing the burning flames of Chimaera that burn 24 / 7 despite having no visible source of fuel. It is not a trick but natural phenomena easily explained by science. I also took a daytime trip to see Phaselis, another ancient city famous for its beaches and a stopping point for blue voyage routes coming from Antalya. After boarding the boat, and settling in, the captain begins his briefing, and it is also nice to meet other passengers that you are sailing with. The short talk covers what to expect from the trip, boat rules and more importantly, shows the sailing route and main attractions worth seeing. 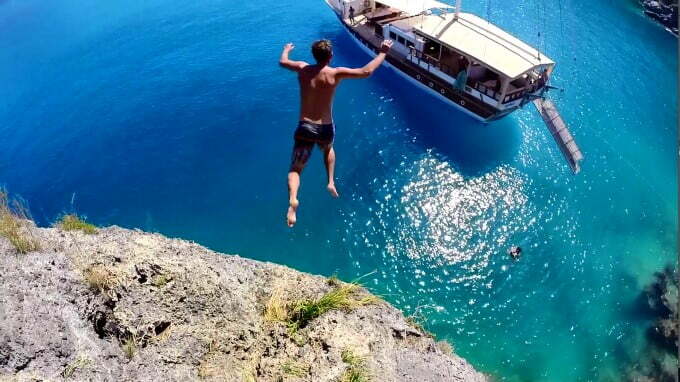 Although the Olympos to Fethiye official Blue Voyage route is set, the captain at this point can alter it to suit the majority preferences of passengers. Demre and Myra are important for two reasons. 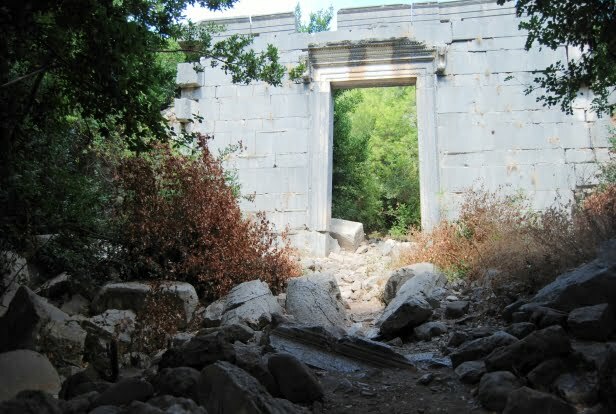 The second is home to some impressive ruins from the ancient city including a large theatre and Lycian rock tombs. While the town of Demre was Saint Nicholas’s hometown and he later became Santa Claus. He spent time there as a bishop and from his good deeds, word of his reputation spread sparking the version of him as we know today. Patara Beach is Turkey’s longest beach and home to the ancient city that was once a member of the Lycian League. The Greek Meis Island once held thousands of inhabitants, but many moved during World War 2. My favourite part of my visit was seeing inside the mystical Blue Cave. Simena is famous for its Byzantine castle, and home-made icecream sold by the locals. Sitting across from the sunken ruins of Kekova, it is a popular stopping off point for yachts and boats. Kas is a cute and quaint, harbour village ringed by excellent bars and restaurants and a new modern marina just a little further on. It is also a diving hotspot of Turkey because of the underwater wrecks and sea life. While it is the finishing destination, this region has many attractions within its boundaries that need at least the whole of the last day to see. Oludeniz and the Blue Lagoon are the most photographed beaches in Turkey because of their beauty, but the region is also an excellent opportunity for a tandem paraglide ride from Babadag Mountain. Butterfly Valley, a green canyon, and hippie-inspired hangout is renowned for snorkelling and trekking to the hidden waterfalls. 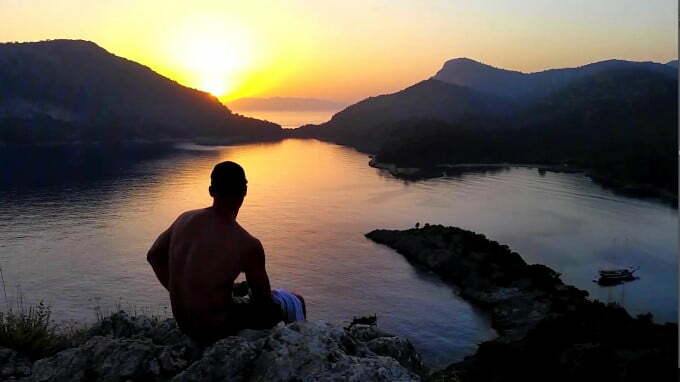 Gemiler Island and its fabulous ancient ruined churches take just a few hours to trek. Most boats drop anchor here for the night adding to the Turkish Riviera vibes, which in my opinion everyone should experience at least once in their life. PS: Some of these photos belong to Sail Turkey, registered under the Alaturka Group, so please don’t use them without attribution. Should be on everyone’s bucket list. Fantastic article., would love to experience this it would make such a change than just going to kus or Bodrum even though I love these towns Always enjoy your blogs very educational, keep up the good work Natalie ?